The week has been slow. Most of our investigators have dropped us or have disappeared or are homeless and we can't find them now. I'm getting to know the 7th branch area well and the members too. For such a small branch, they have fed us the best out of all of my areas. For this week we have scheduled a lot of service. We are required to do 4 hours of planned community service every week. The missionaries last transfer didn't like service so they canceled all forms of service. We are going to be helping at the YMCA folding towels and cleaning and at Brother Cluff's house moving dirt into his huge garden. 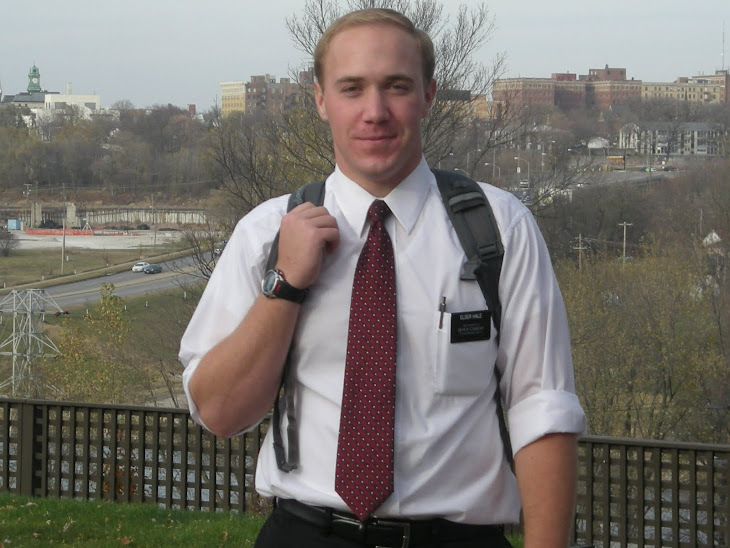 We got a new branch mission leader yesterday, Brother Bently. We moved a recent convert this week. Her name is G. She is an older lady and moved into a retirement home. We visited her a few times after the move to get everything moved around in her apartment and get her internet all set up. We also started the new member lessons last night with her home teachers. It went well. I really don't have much to say, Elder Grow's foot is still messed up and we can't do too much yet. You had asked if I needed anything in a letter you sent me, I don't need anything and will most likely be ok through the end of my mission. I did find a dentist the other day, we were walking by and I just stopped in. I set up an appointment, and thought it a little expensive, and I wanted to run the prices by you. The cleaning was $85, the exam was $46 and the x-rays were $50. Do we have dental insurance with this new insurance group? What do you think? I asked about the exam, and they said they had to do it with all new patients. The appointment is for September 6th so you can write me back about it. This week has been weird. Elder Grow hurt his foot last Monday. We were playing kick ball with a family of investigators and he slid into 2nd plate and messed up his foot pretty bad. He couldn't walk at all and his foot swelled up and turned funny colors. Luckily we had the car this week so all of our appointments weren't all lost. We haven't been able to work very hard due to the injury. I also haven't been able to focus very well. No I'm not getting trunky or anything, but I have felt a less portion of the spirit. Nothing seems to be structured or guided as it once had been. I have almost a stupor of thought while doing every aspect of missionary work. Once I arrived here my teaching has come to a halt, I can't seem to explain principles or the doctrine very clearly as countless time it has been done before. I can't seem to remember where scriptures are or what we were teaching. The Spirit is missing. I only have a couple of ideas why, the environment in the branch and attitudes seem to cause some problems. I think I found the reason I was called to 7th branch, but I'm not sure yet. It's going to test my faith. Thank you for the package, I like the new pillow case, it's awesome. The other one that you made for me when I was in the MTC was getting a little used. I got the new insurance card as well. Should I throw away the blue cross/blue shield card then? I attached some pictures, some of them have Elder Grow in them so you can put them onto your blog. There are more to come. Its a way cool place it actually reminds me a lot of Phoenix. The area that we cover is down town Des Moines and the surrounding neighborhoods. It is the smallest area in the mission and we share it with the AP's. We are in a car share, so every other week we are on bikes getting around the place. Its so sweet, it's a lot like the area where first Fridays takes place, there are a lot of lower class and poor that live there with many run down neighborhoods, but then you have the areas where artsy hipsters move in and remodel and fix up the place. It's so awesome. The branch is a huge change from Quincy. In Quincy the leadership were very bold and respected as they lead with authority. Here not so much. It is a very laid back relaxed environment. I've been kind of quiet trying to understand how everything works and learn all of the members names. The branch is tiny. There were only about 50 to 60 people there on Sunday, and 12 of them were investigators. I gave a talk in sacrament meeting, it was on enduring to the end. Both of the AP's and I spoke for sacrament meeting. We brought the coolest guy to church, Bro. Haynes. He's from Mississippi and loves the Book of Mormon. 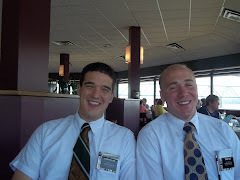 From what I heard he went to church for the first time last week on fast and testimony meeting and bore his testimony of how much he loves the Book of Mormon. He has a baptismal date for the 3rd of September, but this morning we ran into some complications with his living status, he might be moving back to Mississippi. We are going to find out tonight. I attached some pictures. I hope they came through. They are all from Quincy. The last library computers didn't allow me to attach pictures to my e-mails. We had ZLC and leadership meeting last week. I think that it was one of the best meetings that I have been to in a long time. We trained on conversion through the Holy Ghost. It went pretty well, a couple of the elders and sisters came up afterwards and thanked us. We have received transfer doctrine. I will be transferred tomorrow, as well as being released from zone leader. I don't want to leave Quincy, it is the best place to serve. The members are awesome and the missionary work is going crazy. In the last week we have taught a friend of a less active that we have been working with come back to church. It is Sister D's friend, A. We have been working with the D's for the past 2 transfers and she is coming back to church, taken all of the temple prep classes and her son was set apart to be a priest. We have been working with her to stop smoking right now and are having FHE every Monday night at her house. She has been bringing her friend A to church for a few weeks and now we were able to teach her. We set a baptismal date with her and her son C for September 3. Tonight we are going back to teach her and she is going to bring another one of her sons and his girlfriend that are also interested. I love doing this work. It's going to be weird being released, I'm going to be a "normal solider", that's what Elder Phillips calls it. It will be the first time with no leadership calling since I was trained. I've just been thinking what I'm going to do with this next area with just one missionary to worry about. It's going to be crazy. You were asking about all of the purchases around the state in your last letter. Just to give you an idea, usually in one month we are given 1200 miles to use on our car, we used over 2000 miles. We were all over the place, it was a busy month. I heard in the letter, Dad's got an infection? How's he doing? Is it bad?....not good. Oh and for school, I was thinking Paradise Valley or Scottsdale, I don't know whatever one has the best Institute program. You might want to just apply to a bunch of them and then we can see our options. I was thinking of working really hard and get an associates degree in a year so I can transfer that to a university and they will have to accept my classes. I need to get my basics out of the way asap. The closer you get to signing up for classes tell me and President will allow me to call home so I can get everything set up. P.S. Bro. G got a calling!! He's in charge of the scouts. As you know we have been working at the Nauvoo Pageant. Saturday was the last day that it was showing, so we were asked to help take everything down. 2 zones were asked to help, the Quincy zone and the Nauvoo zone. We all arrived around 8 Saturday night and started to take everything down while the pageant was going. We were stuffing semi trailers with picnic tables and benches while everything was going on. After the pageant we helped take down the chairs and load all of them into the trailers. We had to take some of them to the quarry and put into sheds and a barn. After the chairs we started to load parts of the stage into another trailer. We were in Nauvoo until 2 a.m. then a good hour drive home to Quincy. The whole zone stayed over at our apartment that night and slept for a couple of hours until they need to get up to drive back to their areas for church. I was poppin' mints all of church to stay awake. It was a crazy night. This Saturday is transfer doctrine so I won't be writing you until Wednesday. I hope I will be staying in Quincy. If any one is to leave it would be me, so I'll let you know. We had interviews this last week with President Jergensen. He said something crazy that I didn't know. He said that he didn't want to make the new zone, the Quincy zone. He mentioned that we were on a 2 transfer trial run, and if it didn't do well he was going to shut it down. I was a little shocked to hear about this. He went on to say that he was pleased with what has happened in the Quincy zone, and it would not be shut down. A little shocking news to hear after working 2 transfers and your area would have been shut down if you didn't do well. 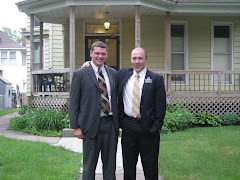 He kind of hinted I would stay in Quincy, but we will have to see after he prays about everything regarding transfers. I didn't know if I told you but Elder Wilson it training! I might have mentioned it but I don't remember. President has been asking me about when I plan to go home. Since I am a IPM missionary, I could go home 3 weeks early or 3 week late. I wanted to ask you if I were to go home early, would you be able to register me for school? Like at a community college of something to start my basics. The thing is if I go home early I will be able to get a semester of school in, if late I will have to wait a few months. Let me know what you think. I have not been to the dentist yet, still working on that. We have a new investigator we are working with, J M. A friend took her to the Nauvoo Pageant and she referred herself to have the missionaries over. We have been teaching her and she is planning to be baptized on Aug. 27th. She came to church yesterday, and I think she liked it. She has been prepared, we left her with a chapter to read after our first appointment and she took 3 pages of notes! That's the first time I have had a investigator take notes, let alone 3 pages! !